Steel springs are synonymous with classic air suspension systems and are often the first thing that comes to mind when looking to make your bumpy motorhome journeys smoother. The history of suspension systems dates back as far as the middle ages when steel springs were used for carts and carriages. Today, Goldschmitt steel springs are amongst some of the best selling springs in the industry. Why Use Goldschmitt Steel Springs? Steel springs are useful in any kind of engineering as they are able to deflect when loaded on to with weight and when the weight is removed it returns to its original state. Steel springs are used in many different kinds of devices and mechanisms from clocks to children’s toys. Goldschmitt steel springs are very strong and flexible, thanks to the carbon molecules inside which are distributed evenly, along with a high level of silicone in the alloys which create strength and elasticity. How Do Springs Improve the Driving Experience? When driving your motorhome over an uneven road surface it can feel bumpy and uncomfortable. The wheels are the areas where the impact is taken from and this, in turn, affects the suspension and springs which work with the vibration dampers to the body of the vehicle. The springs improve the severity of the contact between the wheel and the road, ensuring the components within the vehicle are not damaged in the process. Leaf springs help if there is a sagging spring issue in your motorhome, they are easy to install and do not require maintenance if they are used continually. Goldschmitt leaf springs are Europe’s best selling leaf spring and are available to fit a large range of motorhomes for suspension improvement. Sometimes called cart springs, leaf springs are one of the oldest types of springs, going back to medieval times (pre-dating coil springs) and they are still used in many forms of wheeled suspension today. Leaf springs differ from coil springs by their shape and the different advantages they bring. Leaf springs are arc-shaped; at the centre of the arc is the axle with holes available on either side so that the body can be attached. The different-sized, cut leaf shapes stacked on top of each other, allows the spread of the load to be more evenly distributed. Goldschmitt uses high quality steel and rolled spring ends so that there is less susceptibility to side winds and better handling and manoeuvring. 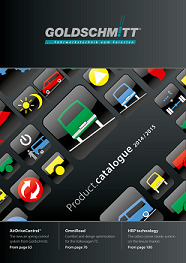 It has supplied around 50,000 leaf springs for motorhomes and lightweight commercial vehicles. As well as leaf springs, Goldschmitt also uses parabolic springs; a spring that contains more than one leaf spring and as its name suggests, it is in the shape of a parabola (a curved u-shape). Designed for low internal friction and low weight, the leaves touch in the centre where they are joined to the axel and at the ends where they are fixed to the vehicle. They are also suitable for up-rating (model dependent).